rfcomm does not work properly. In debian, rfcomm bind returns tty support not available. Therefore, I cannot connect to a bt serial Port. On ubuntu, it doesn‘t even find hci0. The bluetooth Adapter is Not detected. Tried various rebuilds of the kernel with different bluetooth options set, but it remains the same. 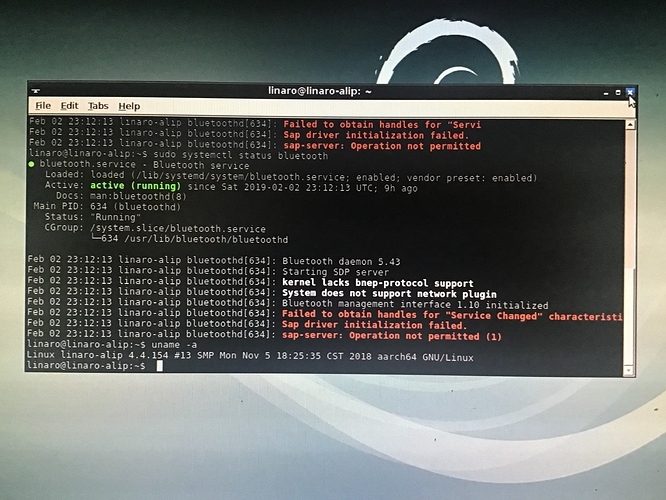 No bluetooth adapter found rock@RockPi(~):ls /lib/modules/4.4.154-59-rockchip-g5e70f14/kernel/drivers bcma block gpu i2c md media misc mtd net pps scsi ssb switch usb w1 rock@RockPi(~):hcitool dev Devices: rock@RockPi(~):hcitool scan Device is not available: No such device lsmod and dmesg both produce no bluetooth output Any suggestions? I tried with armbian. The problem ist exactly the same as in debian. After starting bluetooth, the bt serial port can be paired but not connected. Trying manually with rfcomm bind yields RFCOMM TTY support not available. Doesn‘t work einher. Doesn‘t even find the bt Adapter. Seems like Kernel module btusb is missing. Ideas?